METUCHEN — For the majority of the first half Wednesday afternoon, the field was tilted in Carteret’s favor, with the Ramblers coming away with the game’s better scoring chances. But, the Metuchen High School girls soccer team regrouped at halftime and came out with a more assertive second stanza, emerging with a 3-0 win thanks to a pair of goals from Katharine Chura. At intermission, Metuchen head coach Val Gazda spoke to her team about getting back to what had worked for them coming into the game, and about how they had managed to win their first seven games by a combined score of 36-3. Chura got the Bulldogs on the board five minutes into the second half, pounding home a header off a corner kick from her sister Melissa. From there, Metuchen controlled the ball better than they did in the first half, consistently working their way deep into Carteret territory and forcing the Ramblers’ defenders to work hard for the ball. Only 11 minutes after the goal that got Metuchen going, Emily Costello made a great move down the right wing, eventually crossing a pass to Katharine Chura, who settled the ball to her feet and beat Carteret goalkeeper Aisha Chauhan to make it 2-0. Metuchen would add a third goal with just minutes remaining in the contest when Savannah Wolfe worked the ball down the wing and centered it to Allie Chalker at the top of the box. Chalker played it down to her right foot and blasted a shot over Chauhan’s outstretched arms for the match’s final tally. Even after dominating the first half, Carteret couldn’t get a goal past Emily Buchanan, who made four saves in the contest. The dynamic scoring duo of Ciara Alston and Fiorella Doglio for the Ramblers’ was held in check, but Gazda noted that she wasn’t sure if that would be the case coming in. The contest got a bit choppy in the second half, with multiple fouls leaving players on the ground and looking for assistance to get to the sideline. But, the top two teams in the Blue Division battled each other hard in the first of two meetings this season. They’ll meet again in Carteret on Oct. 14 and if the Bulldogs are to sweep the season series, Gazda knows they need to play a full 80 minutes of solid soccer. Wednesday’s matchup at Metuchen between Carteret and the host school will feature the top two teams in The Home News Tribune’s Top 10 in what figures to be a high-scoring affair. Coming into the game, both No. 2 Carteret and No. 1 Metuchen have scored 30 or more goals this season, with three of the state’s top scorers leading the way. The Ramblers have a pair of 10-plus goal scorers through Tuesday, in senior Ciara Alston and sophomore Fiorella Doglio, who have each exploded for monster games already this season. Alston leads the team with 14 goals, including a hat trick on Monday against J.F. Kennedy, and Doglio added two to her total of 13 with a pair against the Mustangs. Each has a four-goal outburst in Carteret’s first eight contests, leaving opponents to focus on both of them equally, which is no easy task. But the Bulldogs have their own ace, with senior Emily Corson leading an offensive attack that has outscored its opponents 36-3 in seven games. Corson has scored 12 goals, including a two-goal, one-assist performance in the season opener in which Metuchen head coach Val Gazda picked up her 300th career victory. Corson is coming into this one on a hot streak of her own, after picking up a hat trick against Wardlaw-Hartridge on Monday. With all the attention shifted towards the offensive players on both of these teams, it’s easy to overlook the defense and goalkeepers, two units that rank amongst the state’s best. Carteret has a dynamic keeper in Aisha Chauhan, who has made 84 saves this season and is a big reason as to why the Ramblers have a plus-32 goal differential. 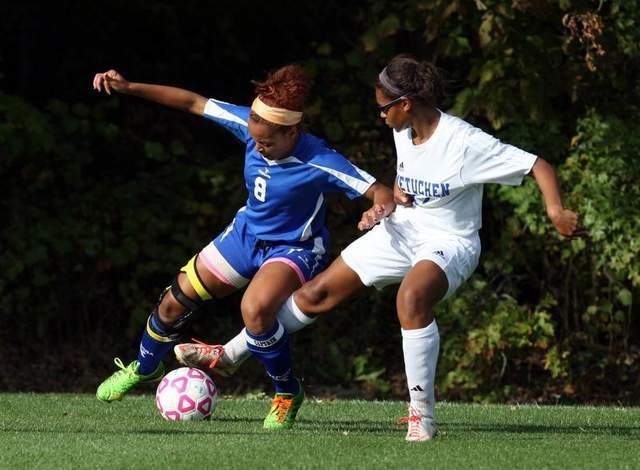 Emily Buchanan mans the goal for Metuchen, and while she doesn’t have the save numbers that Chauhan has, that is a product of the Bulldogs dominating the possession and not allowing opponents to get quality looks against Buchanan. Cardinal McCarrick, which enters the Top 10 this week for the first time, is off to a hot start behind senior Megan Kosa. The Eagles have won four of their five contests in 2013, with Kosa’s 10 goals a major reason why. There are only 16 players state-wide to be in double digits in goals this early in the season, but Kosa is one of them, ranking fourth in the conference with her 10. The Eagles have also received solid performances from Madison McNally (five goals, four assists) and Nicole Rogan (four goals, two assists). The area’s five first-year head coaches have gotten off to uneven starts in the season’s first three weeks, but things look up for all of them. Jen Vroman (Piscataway) has seen the Chiefs win three of their first six and Nick Chappell (Mother Seton) has his squad at 2-4. Leanne Rubiano’s Edison squad has been competitive in all five of their games and is currently on a three-match unbeaten streak. Tim Morris (Middlesex) got his first victory on Sept. 18 against New Brunswick and fellow first-year coach Emily Husband. The Zebras are still in search of their first win for Husband, but have had trouble scoring this season. Their last two matches have been much more competitive after a tough stretch to begin their campaign. 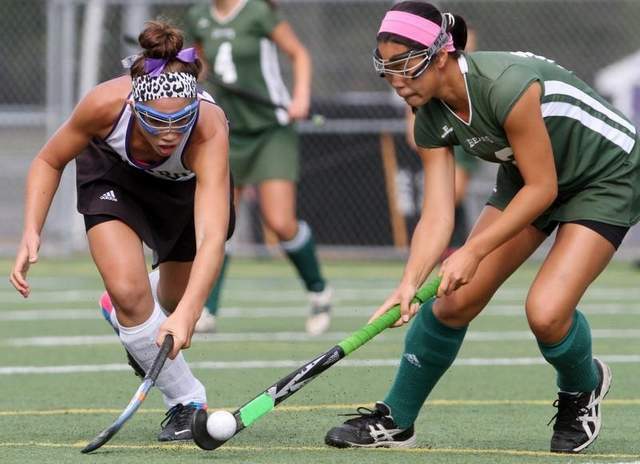 SOUTH PLAINFIELD — After winning the first six games of the season and racking up 33 goals in the process, the South Plainfield High School field hockey team has put the rest of the Greater Middlesex Conference on notice. The defending GMCT champions had outscored opponents 33-4 in the season’s opening month prior to a 5-0 drubbing of Sayreville (1-2-1) Tuesday afternoon, with senior captains Jess Bishop and Shannon Hughes leading the offense. The duo has combined for 41 points this season and both added to their totals against Sayreville in a game where the Tigers didn’t appear to have their best effort throughout much of the first half. Bishop scored her 12th goal of the year and added two assists to give her eight for the season and Hughes scored once and assisted on two more goals to pad her totals to 12 and nine respectively. Having a pair of elite players like South Plainfield (7-0) does is quite a luxury for head coach Cheryl Hughes. The Tigers expect to get every team’s best shot this season and that includes the Metuchen Bulldogs (4-2), who’ll be the Tigers’ next opponent Thursday afternoon. Cheryl Hughes knows that her squad will have to play better than they did against Sayreville to remain unbeaten in the GMC. But having Bishop and Shannon Hughes, along with the senior leadership of Emily Lubach should help the Tigers avoid another less than stellar start. With two eight-goal games already in their pocket this season and three others with five or more goals, including Tuesday’s win over the Bombers, South Plainfield has what it takes to score with anyone in the state, including Metuchen’s duo of Gulotta and Volpe, who have teamed up for 18 points this year. The biggest challenge for the Tigers on Thursday is to come out and not expect a victory without putting in the work, according to Lubach. “Every game isn’t going to be a walkthrough, we need to treat every game like it’s a championship and we need to go out and work for it every game we play,” she said. South Plainfield’s Nicole Sottiriou competes on the balance beam in Saturday’s Raider Invitational. Photo by: Kathy Johnson. HILLSBOROUGH — Just one year after winning two events and taking home the All-Around title, South Plainfield High School gymnast Nicole Sottiriou upped her performance and won three of the four events and her second straight individual title at the Raider Invitational on Saturday afternoon. Sottiriou won the vault, balance beam and floor competitions and scored 37.550 points in total, improving in all areas from last year’s event. She won the vault with a score of 9.450, which was up from the 9.375 she won with last season, took the beam and floor exercise with a 9.6 in both events. “I really love floor, it’s my favorite event, so I’m glad that I won it. I was extremely nervous for beam, but I got a good score and I was thrilled,” Sottiriou said. South Plainfield, with Sottiriou leading the way, finished third in the team competition, less than one point behind Hillsborough for second place out of the six schools in attendance. Hillsborough, the host of the event, scored 106.075 to finish second behind Freehold, behind a balanced attack from their roster. Sarah Pallay placed third in the all-around competition, scoring 36.700 to lead the Raiders. Pallay came in second on the vault (9.3), third on the floor (9.375) and the uneven bars (8.925) and fifth on the beam (9.1). Alexis LoCasto was Hillsborough’s other standout, placing second on the beam (9.275). Bridgewater-Raritan’s Emily Shugan denied Sottiriou an unbeaten day, winning the bars with a score of 9.525. TEAM SCORES: 1. Freehold 106.425; 2. Hillsborough 106.075; 3. South Plainfield 105.075; 4. Bridgewater-Raritan 102.175; 5. South Brunswick 95.075; 6. Old Bridge 94.975. ALL-AROUND: 1. Nicole Sottiriou (South Plainfield) 37.550; 2. Jenna Crisalli (Freehold) 37.275; 3. Sarah Pallay (Hillsborough) 36.700; 4. Shani Weiss (Freehold) 35.225; 5. Gianna Marcovecchio (South Plainfield) 33.725. VAULT: 1. Nicole Sottiriou (South Plainfield) 9.450; 2. Sarah Pallay (Hillsborough) 9.300; 3. Jenna Crisalli (Freehold) 9.200; 4. Alyssa Fodera (Hillsborough) 8.625; 5. Shani Weiss (Freehold) 8.550; 6. Jillian Pepe (Old Bridge) 8.375. UNEVEN BARS: 1. Emily Shugan (Bridgewater-Raritan) 9.525; 2. Jenna Crisalli (Freehold) 9.400; 3. Sarah Pallay (Hillsborough) 8.925; 4. Nicole Sottiriou (South Plainfield) 8.900; 5. Shani Weiss (Freehold) 8.725; 6. Carly Kensey (South Plainfield) 8.500. BALANCE BEAM: 1. Nicole Sottiriou (South Plainfield) 9.600; 2. Alexis LoCasto (Hillsborough) 9.275; 3. Jenna Crisalli (Freehold) 9.250; 4. Shani Weiss (Freehold) 9.175; 5. Sarah Pallay (Hillsborough) 9.100; 5T. Grace Tutunjian (Hillsborough) 9.100. FLOOR EXERCISE: 1. Nicole Sottiriou (South Plainfield) 9.600; 2. Jenna Crisalli (Freehold) 9.425; 3. Sarah Pallay (Hillsborough) 9.375; 4. Kayla Massaro (South Plainfield) 9.100; 5. 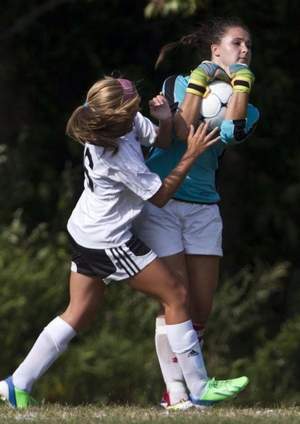 Faye Lawrence (Bridgewater-Raritan) 9.025; 6. Arah Godbole (Freehold) 9.000. EAST BRUNSWICK — Just one week after seeing the third-longest winning streak in the state come to an end in a shocking loss, the Sayreville High School football team began a new streak on Friday, routing East Brunswick 42-0 behind a dominant rushing attack. Senior halfback Deion Miller led the way with 14 carries for 169 yards and two touchdowns and Myles Hartsfield rushed for 130 yards and a pair of touchdowns and added a 77-yard punt return for a score to pace a Bombers attack that went for 400 total yards in the contest. Nine different Sayreville players carried the ball at least once and in the second half, with the starters resting, Brandon Allende and Jarrod Henry did the heavy lifting, combining for 69 yards on the ground. Sayreville (1-1) didn’t attempt a pass in the game, with quarterback Malik Pressley out with an ankle injury. “We didn’t want to throw the ball if we didn’t have to and we wanted to see how our running game was going and there was no reason to throw the ball tonight once we had success on the ground,” Najjar said. Hartsfield got the Bombers on the board less than two minutes into the game, when he returned a punt 77 yards for a touchdown, going untouched down the right sideline after the Sayreville defense forced a three-and-out to open the game. The junior lined up as a wildcat quarterback for a good number of snaps in the game and also operated out of the wing, but his punt return set up the team for a bounce-back victory after losing 35-19 to Old Bridge in Week 1. “That gave us a big lift. It was a great way to start the game, we had a three-and-out and then he brought that back and gave us the lead and gave us the confidence we needed,” Najjar said. East Brunswick (0-2) couldn’t do much at all with the football, going three-and-out three times in the game and accumulating just 128 yards on offense. Quarterback Kevin Hemmings led the Bears with 86 all-purpose yards, including a 46-yard run on an option keeper. “Defense played very well; they played intense and they rallied to the football and that’s what we’re looking for,” Najjar said. RUSHING: S –Miller 14-169, Hartsfield 12-130, Henry 3-35, Allende 5-34, Cenci 3-13, Crump 2-10, Rodriguez 3-7, Davis 1-3, Klein 1-minus 1; EB – Hemmings 5-70, Tomori 5-29, Gerhartz 13-14, Walker 1-minus 1. PASSING: EB – Hemmings 3-10-16. RECEIVING: EB – Werder 1-8, O’Sullivan 1-6, Mehkri 1-2. DUNELLEN — Just two days after scoring a hat trick, junior Olivia Draper found the back of the net twice more on Wednesday, helping the Highland Park High School girls soccer team to a 3-1 victory over Dunellen at Columbia Park. Draper connected on goals in the 4th and 40th minutes of the first half, bookending a solid all-around effort by the Owls. Jessica Dresch also clicked in the opening 40 minutes for Highland Park, which scored a 6-1 win over South Amboy Monday. Even though the Owls took a two-goal lead into intermission, coach Chris Ruckdeschel saw areas that his squad needs to improve if they’re going to be serious contenders in the Greater Middlesex Conference this season. The opportunities that were finished came in the opening stanza, when Draper took advantage of a misplayed ball deep in the Dunellen end of the pitch and tapped in her fourth goal of the week. After Jackie Von Itter tied the score for the Destroyers in the 16th minute, Dresch, who had entered as a substitute, was in the right place at the right time. Once again, the Dunellen defense broke down and Dresch lofted a shot that eluded freshman goalkeeper Casey Olsommer’s hands to put the Owls on top for good. Draper’s second goal of the game came in the final seconds of the first half when she took a perfectly placed crossing pass from Sophie Gillerman near the top of the box and struck home her fifth goal of the season. Draper said that she’s been working on using her weaker foot, her left, more to become harder to stop on offense and the scary thought for opponents for the rest of the season is that she thinks she’s just scratching the surface of what she can do with the ball. Highland Park had the better chances on net in the second half, and even though they weren’t able to add to their lead, Ruckdeschel knows that his young squad is still learning to play with one another. “This game is about knowing when to move forwards and when to move backwards and it’ll come with time. We’re a young team, with only four seniors, but the leadership has been tremendous up to this point,” he said. 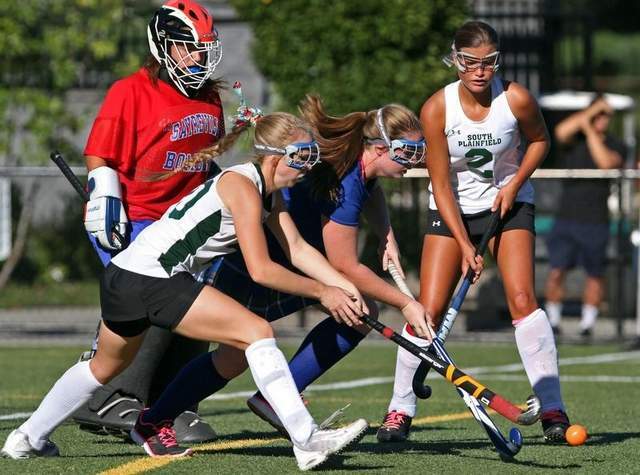 MONROE — Despite falling behind in the opening portion of their contest Monday afternoon, the East Brunswick High School field hockey team stayed the course and found their offensive touch, doubling their season output in goals scored en route to a 3-2 victory over Monroe Monday afternoon. Senior Rachel Huang recorded a first half hat trick to pace the East Brunswick (2-2) attack, which had scored just three goals in three games to begin the season. “We’re still working on a lot of things and we’re still getting into a rhythm and we’re working on our chemistry so I just wanted to help out the team today with my offense,” Huang said. The help was needed, especially after Monroe jumped out on top just 3:45 into the game, when Jenna Parisen beat Emily Polinski for the goal. But the Bears knew that they needed to stay the course and play their game, something that head coach Cindi Todoroff praised afterwards. Less than 10 minutes after Parisen’s tally, Huang connected on her first goal of the season, taking a Meagan Costello pass in the middle of the defense and slapping a shot into the back of the goal. But the 2012 Home News Tribune first team All-Area performer wasn’t done, as she put the Bears on top for good five minutes later. Taylor McNamara fed Huang on top of the offensive formation and Huang ripped a shot home exactly halfway through the opening 30 minutes. For good measure, Huang completed the hat trick with an unassisted goal just before intermission. “We stuck to our plan and stayed patient and Rachel had three goals; in games like this you look for your impact players to step up and that’s what happened today,” Todoroff said. Monroe got back into the game midway through the second stanza when Jenna Morelli clicked on an unassisted goal at the 15:30 mark, but the Falcons couldn’t get the equalizer as the time ticked away. The Falcons were able to keep East Brunswick off of the scoreboard in the second half, something that Huang said is becoming customary of Monroe’s teams during the years. “They play really good defense and it was just a lot of unforced errors that I was able to take advantage of; without those errors, it would have been a really close game,” she said. Even with the victory that evened up their season record, Todoroff knows that her squad has plenty to work on at practice. BERKELEY HEIGHTS — In a game that will go down as one of the strangest for every player and coach involved, the Scotch Plains-Fanwood High School football team walked away a 20-14 winner over Governor Livingston in a contest that started Thursday afternoon, was postponed due to lightning and concluded Friday, more than 24 hours after the initial whistle blew. The two teams were forced to leave the field with 5:31 remaining in the fourth quarter on Thursday night when the skies opened up bringing large bolts of lightning and heavy rain on the area. The Raiders had a 20-7 lead at the time of the weather delay, and having to go home and sleep on it was not something Scotch Plains-Fanwood head coach Jon Stack enjoyed. The Raiders only needed to defend the final five and a half minutes to secure a season opening victory, but Governor Livingston made sure that it wasn’t easy. Faced with a second-and-20 from their own 36 to resume play on Friday, the Highlanders marched down the field in seven plays, taking just 1:23 off the clock, with quarterback John Wills throwing a 20-yard touchdown pass to Jensen Butler for the score. After the PAT cut the lead to 20-14, Governor Livingston kicked the ball deep, intending to use their final two timeouts to get the football back with a chance to win the game. The Raiders took over at their own 30 with 4:02 on the clock and proceeded to use all but two seconds of the remaining time to secure the victory. But it didn’t come easily. After quarterback Marquel Taylor picked up a first down and forced Governor Livingston to use their final timeout, the Highlanders defense held up and brought up 4th down. Jordan Jones, who had returned a punt 41 yards for a touchdown on in the third quarter on Thursday night, dropped back to punt it away, but the snap was low. Alertly, Jones picked up the ball, ran around for a good 10 seconds and kicked the ball down the field, eating precious seconds off the clock. The Highlanders eventually scooped up the ball and were granted one play from their own 25 to win the game, but a hook-and-ladder pass fell well short. The star on offense for Scotch Plains-Fanwood was junior tailback Kobe White, who rushed for a career-high 170 yards on 23 carries, including a 65-yard touchdown run. In 2012, White rushed for just 200 yards in the entire season. After the game, he was quick to deflect praise to his blockers. Taylor gained 95 yards on 12 carries, with a 45-yard touchdown run mixed in for the Raiders, who gained 292 yards on the ground. Governor Livingston scored on their fifth play of the season on Thursday night, when tailback Ryan Jennings plunged in from 1 yard out. Jennings, who had 77 yards on 22 carries before the rain came, had all 28 yards on the Highlanders’ opening drive. RUSHING: SPF – White 23-170, Taylor 12-95, Maxwell 4-16, Smith, C. 1-5, McQuoid 1-5, Smith, M. 1-0; GL – Jennings 22-77, Butler 2-36, Boyd 2-1, Mahoney 1-1, Jamolawicz 1-1, Barone 1-0, Rhodes 1-minus 1, Wills 2-minus-7. PASSING: SPF – Taylor 2-10-20; GL – Wills 6-11-95, Mahoney 1-8-10. RECEIVING: SPF –Monahan 2-20; GL – Butler 6-79, Ragazzo 2-19, Jamolawicz 1-7. And after a scoreless first half that saw neither team come away with a real quality scoring chance, Old Bridge got the game’s lone goal just after the break for a 1-0 victory in their season opener. In the 46th minute, Old Bridge pushed forward and eventually won the ball down the right wing, with Lauren Coletti coming away with the ball. The senior got the ball on her right foot and crossed it into the box, where Gianna Taranto settled it down and struck it into the upper right corner of the net for the game’s lone marker. “When the time came and kids were in the right spots defensively and offensively, we stuck in the goal when we had a chance and it was a good opportunity for us,” Old Bridge head coach Rob Lozzi said. Bishop Ahr, who had played on Monday and defeated Edison 2-0, couldn’t muster a threatening look at the goal until deep into the second half, and when they did, Knights’ goalkeeper Alley Mauer was there to deny them. Mauer finished with 11 saves to pitch the shutout. “A really, really solid effort from Alley today,” Lozzi said. Mauer came up with three dynamite saves after the Knights had taken the lead, one coming on a free kick from about 30 yards away. But the best of the day came in the 75th minute, with Bishop Ahr pushing everyone forward, when Mauer made a diving stop to her right that preserved the victory. Both teams needed to be on top of their games in the heat of the early season, as both coaches substituted often to keep players fresh. But it wasn’t just the heat that held back the two sides, as throughout the contest, passes went awry and the rhythm of the contest slowed down. Alexa Poveliaitis had Bishop Ahr’s best opportunities in the second half, but couldn’t solve the puzzle that was Mauer on this day. “Bishop Ahr is a very good team and I think down the line they’ll be a team that we’ll see at the end of the season,” Lozzi said. EDISON — In their season opener against Princeton Day last week, The Wardlaw-Hartridge School girls soccer team couldn’t find the back of the net in a 1-0 defeat. But in their first conference match-up of the year, the Rams (1-1) found their rhythm to the tune of five goals as they edged Carteret 5-3 Monday afternoon. The fact that the Rams had four different players score goals, led by Laura Arriaza’s pair, was something that head coach Jackie MacLean was very proud of. Wardlaw-Hartridge jumped out to a 2-0 halftime lead, thanks in large part to Alex Garces. The sophomore set up the first tally with a well-positioned corner kick which Taylor Gerhart jumped on in front of the Carteret net and Garces got herself a goal less than five minutes later when she took a Mairead Forrest pass and ripped a shot past Ramblers goalkeeper Aisha Chauhan. The Rams extended their lead just into the second half when freshman Carlin Schildge recorded her first varsity goal. But, Carteret (1-1) didn’t fold, thanks to a 1-2 punch on offense of Ciara Alston and Fiorella Doglio that not many teams possess. Doglio, who had scored four times in Carteret’s season opening victory over J.F. Kennedy last week, didn’t get her first shot on goal until the 55th minute. Ciarra Varley stuck to Doglio throughout the contest and didn’t let the talented sophomore get loose to cut into the lead. But in the 67th minute, Alston converted a through-pass from Doglio to get the Ramblers on the board and cut the lead to 3-1. “Carteret is a team that constantly pressures from start to finish, regardless of how many goals they’re down and we know that because we’ve played them a lot and they’re always fought hard against us,” MacLean said. Arriaza’s pair of goals, which came less than 10 minutes apart following Alston’s marker, seemed to put the game out of reach, but in the final moments, Carteret made things interesting. Doglio ripped a shot from outside of the box that squeaked through goalkeeper Lacey Gress to make the score 5-2 and moments later, Alston raced up the right wing and fired a shot past Gress to cut the lead even further. But the young Rams defense held on from there, something that Forrest said comes from playing competitive games this summer.